What better way to help bring home the magic than... with the yummy snacks that we love so much in our favorite place. All photography by Roxy Yang. So I went to Nandos Peri Peri, to get said dole whip... but the machine was broken. It's ok though! They said it would be back soon and that they actually have it at all their locations. So another trip is planned in the future to go back and get all the dole whips. In the mean time, it got me thinking about all the magical food around me! After all, innovation is born here in Chicago. Or at least Walt was... so thats good enough! But I thought, how fun would it be to treat my hometown like Disney. What if I went on a search for all of the fun magical things there are to do and eat here, while dressed in Disney. First on my list was dole whips, but second was donuts! So I hopped online and started searching for tasty treats and I found Glazed and Infused. Located at 939 W. Armitage in Lincoln Park (there are more locations, this is closest to my house), Glazed and Infused, is warm and inviting with its bright colorful storefront and delicious aroma of fresh baked donuts. They have all sorts of flavors, including a donut named after Chicago's own Pilson neighborhood! It is AMAZZZZZZING! You must try it! Now, I was born and raised in Chicago, left for Florida and California after high school, but came back and remained a creature of habit. When we are home, I get into a routine of convenience. I started Dressed in Disney to break up the mundane of my life. To find magic back here, in my normal everyday. I spent the past year traveling a ton and spent LOTS of time in the Disney Parks. It was absolutely wonderful, but I got home thinking... what happened to bringing the magic home. So I decided it was time to get back to my roots. To awaken the Disney within Chicago. My goal is to also make that magic accessible to those of us who can't get to the parks regularly or for those who have never been but hope to! To me, Disney magic means breaking out of routine and finding laughter and your inner child. 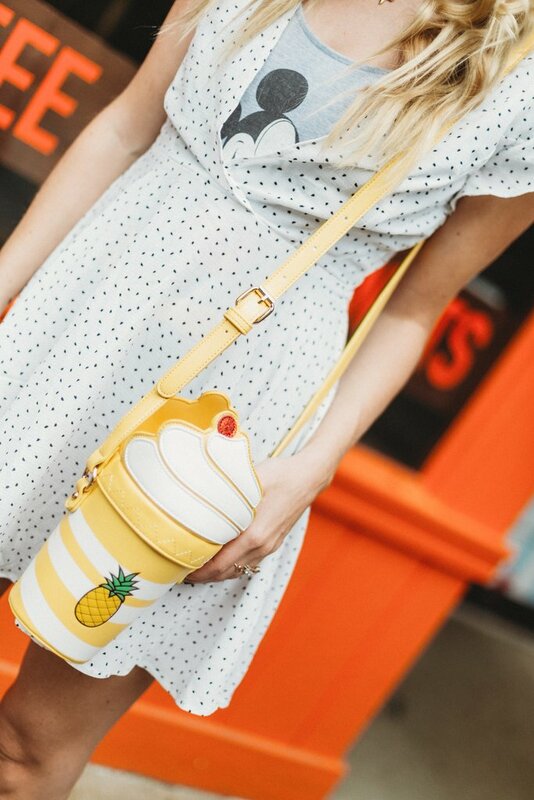 Mostly, I find this through fashion, wearing a bag in the shape of a dole whip or wearing Minnie ears to target. It can be subtle or grand, but either way, its fun! I like to believe that we are the ones that can fill the world with sunshine, if only we try. Walt knew, that Disneyland... Disney World, would be nothing without the people who filled it. Our homes, our lives, or workplace... I truly believe that we can bring that same magic wherever we go. It is up to us. So as I embark on this venture of bringing home the magic, I hope you find it helpful. I hope it brings you joy. And I hope it would be encouragement to bring your own magic to your hometown and to your friends and family. And take me with you! I would love to see where you are going and how you are bringing home your magic, or Disney magic! #dressedindisney and #officialmousebabe.